World Youth Alliance Asia Pacific (WYAAP) has recently concluded the year-end run of the Human Dignity Curriculum (HDC) on December 4, 2018, which was in partnership with Christian Mission Service Philippines (CMSP) in Pasig City, Philippines. The program ran from November 21 until December 3, 2018. 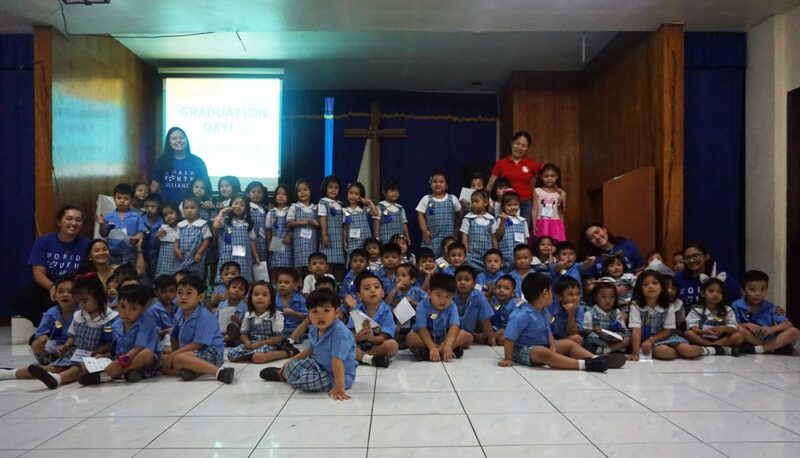 WYAAP staff and volunteers, together with the CMSP teachers, held a small graduation ceremony for the children last December 4 to celebrate another successful run of the HDC and to recognize the children’s achievements in front of their peers and parents. For this run of the HDC, WYAAP worked with kids from ages 3 to 5 years. The HDC aimed to lay a solid foundation of the concept of human dignity in these children’s lives, as well as to make sure that they will be able to carry and apply these lessons in their everyday lives. The sessions were led by WYAAP staff Joyce Cedeño and WYAAP interns Krystle Bayombong, John Chanchico, Louie Cudo, Johanna Gatdula, and Stephanie Höglund. Throughout the sessions, students were taught the importance of understanding their dignity and realize their endless ability to do good things and make excellent decisions. The HDC is an educational program of World Youth Alliance that focuses on encouraging students to understand their dignity as human beings. It aims to guide the students to a path wherein understanding this dignity, they would be able to nurture habits that would develop their way of living and worldview towards excellence. WYAAP would like to extend its gratitude to Teacher Gina, Teacher Joy, and the rest of the CMSP staff for welcoming us with open arms and for helping us to further extend the reach of WYA’s principles. We would also like to thank the students and their parents for the heartwarming and fulfilling experience.